Third Saturday of the month, which means it’s time for soup! I regret to admit I haven’t joined this fun event for the past 4 months. Too many trips and work commitments made it impossible. But I am back now, and thrilled to join their party. This month’s event is hosted by Amy, from Amy’s Cooking Adventures. She chose Quick Weeknight Soups as the theme. My choice is so easy that I made it for lunch, from start to finish. On a working day. Are you absolutely amazed, mesmerized, intrigued, and anxious for the recipe? I thought so. I adapted it from a Martha Stewart recipe that called for soba noodles. I zoodlelized it, and made a few other minor changes. In a large saucepan, heat oil over medium. Add mushrooms and ginger; season with salt and pepper. Cook, stirring occasionally, until mushrooms are tender, 6 minutes. Add broth and 3 cups water; bring to a boil. 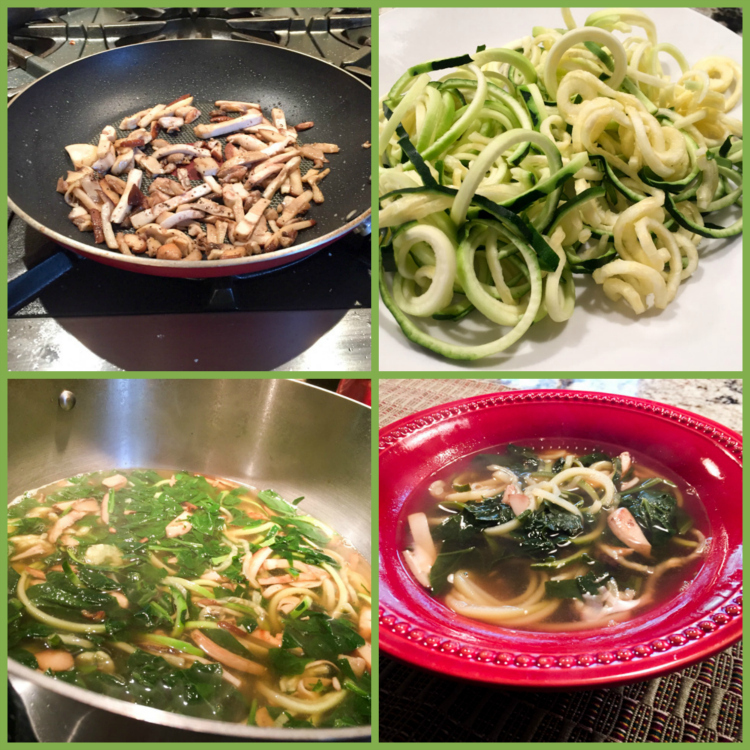 Add zucchini noodles; reduce to a simmer, and cook 5 minutes. Add spinach; cook just until tender, about 1 minute. Add lime juice and soy sauce. Serve very hot. Comments: One of the easiest soups to make ever! It surprised me how much flavor it packed with so few and humble ingredients. The soy and the lime juice added at the very end, right before serving, deliver a mixture of umami and brightness. Umami echoed by the mushrooms, brightness intensified by the ginger. Really delicious and so very light. I picked this soup as my lunch on a day we had a departmental seminar scheduled for the afternoon, so anything that is too heavy makes it a bit hard to stay awake. Unless, of course we are talking about a fantastic speaker on a subject that is very dear to my heart. Unfortunately, not always the case. I was not going to blog on this recipe, since it was one of those improvised things, quickly assembled for lunch on a weekday. But I tasted a spoonful straight from the saute pan, and the “Must-Blog-This” alarm went off, loud and persistent. I quickly transferred some to a serving bowl to be immortalized on camera. The almond butter takes this simple stir-fry to a higher level of deliciousness. Amounts for the recipe are pretty flexible, I was just using stuff that I had in the fridge so you can go with the flow and add a bit more of this, a bit less of that. 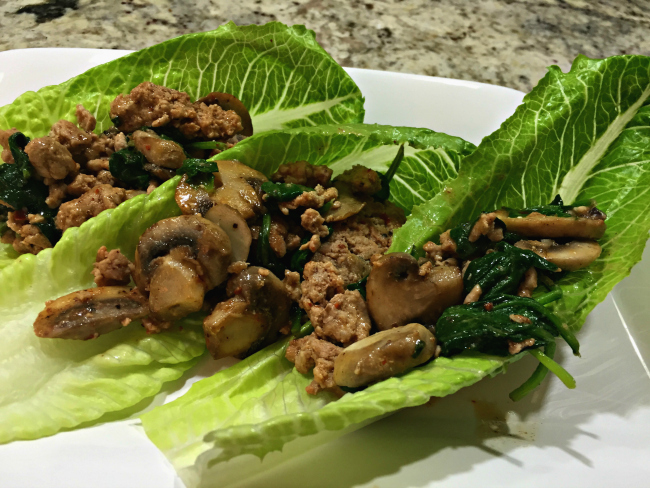 If you care about this type of info, this concoction would be low-carb and also Paleo-friendly. But what I really care about is that it is mighty tasty. Heat the oil in a large saute pan. Add the mushrooms, season with a little salt and pepper, saute for about 5 minutes. Add the ground meat, Aleppo pepper, a little more salt and regular pepper, cook moving it around every once in a while, until the meat is golden brown. Add the almond butter, incorporate well, keeping the pan in medium-heat. Add the spinach and stir until wilted. Right before serving, squirt some lemon juice all over the meat. Adjust seasoning if needed. ONE YEAR AGO: Secret Recipe Club: Tailgating Party! 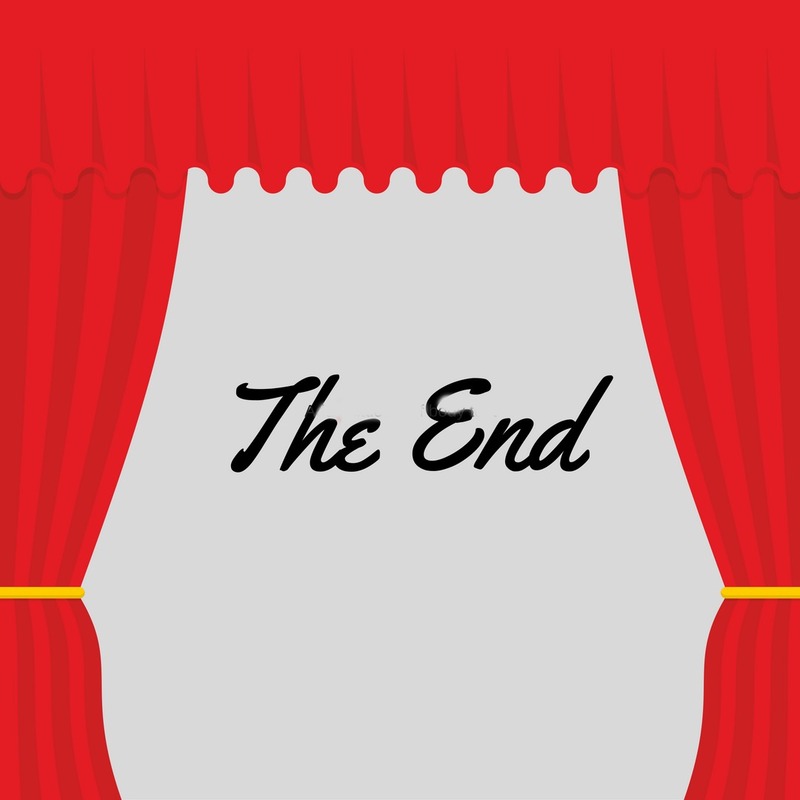 TWO YEARS AGO: One Million Page Views! Soup weather is here to stay. I should not complain, actually, so far things have progressed more or less smoothly. Anytime December catches me in my neck of the woods going for a morning run with no gloves, no hat, no growling, and wearing only a light long-sleeved shirt, I am a happy camper. Actually, happy jogger is more like it. But, let’s face it, things will get nasty soon enough and diving into a creamy bowl of soup feels like the right thing to do. I improvised this one using stuff I had in the fridge, not sure how it would turn out, but it was so delicious I had to share. 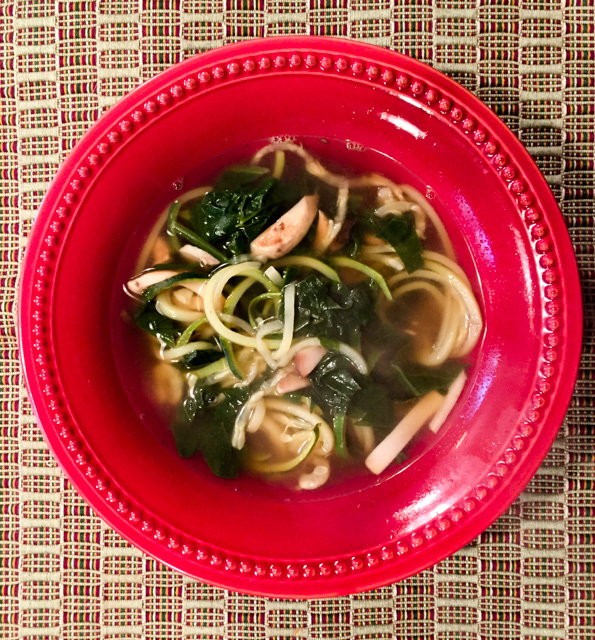 The combination of zucchini with mushrooms might be a bit unusual, but worked very well… If you care to know, the soup is Paleo-friendly, low in carbs, and high in deliciousness. Heat 1 tablespoon of olive oil in a pan, when hot add the onion, season lightly with salt, pepper, and a little za’tar, if using. Saute until onion is translucent, add the mushrooms, and cook them in medium-high heat, stirring occasionally. If the pan gets too dry, add another tablespoon of olive oil. When the mushrooms are starting to get soft, add the zucchini, cook for a couple of minutes then add chicken stock and water. Mix well, cover the pan and let it simmer for about 12 minutes. Turn the heat off, add thyme and spinach. Mix, transfer the contents to a blender. Blend very well, being careful (hot stuff in a blender can be dangerous, do it in batches if necessary). Return the blended soup to the pan, add the coconut milk, warm it up in low-heat, taste and adjust seasoning. Serve with toasted coconut flakes or any other topping you like. Comments: I am very fond of zucchini soup, and also love a nice creamy mushroom soup. Never thought of marrying both ingredients. When mixing zucchini with mushrooms you’ll enter a twilight zone of unappealing color that can be tricky to deal with. After all, part of the charm of zucchini soup is its beautiful green, but the mushrooms mess that up. That’s when the fresh spinach enters the scene. I use this trick often when I want to perk up the green color of a soup. The secret is to add it right before you blend the soup, and don’t add too much. You won’t be able to tell there is spinach in it because the zucchini and mushroom flavor is prominent. Use a nice blender, if you have a Vitamix put it to work for at least a couple of minutes. You will have a gorgeous green soup, creamy, soothing, flavorful. 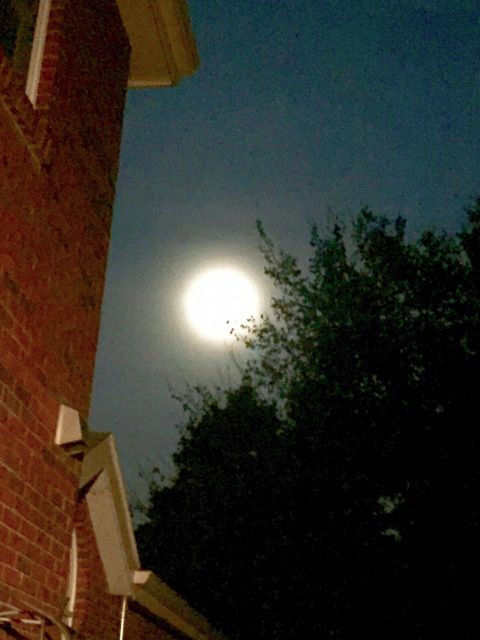 It will be light but keep you satisfied, thanks in part to the fat from the coconut milk. I had a bowl of this soup on a Saturday after running and felt like a million bucks after. Two Aleve pills as a side dish probably did not hurt either. When I was 13 years old I could not WAIT to turn 18. It took forever, but as you may have noticed, I made it. Now that I feel like setting the brakes on time, days pass flying by, turn into weeks, months, so here we are at the end of May, and I find myself with quite a few years added to those eighteen. Unreal. Anyway, the last Monday of May brings with it the formidable joy of Reveal Day from The Secret Recipe Club. If you don’t already know about it, a food blogger is paired with another one in secret, has about a month to pick a recipe and cook from it, then the whole group blogs about their chosen dish at the exact same time. Nothing is cooler than this, you must admit. I was paired this month with Life on Food, hosted by Emily, a 31-year-old woman with stunning blue eyes and a food blog that is a stalker’s dream! 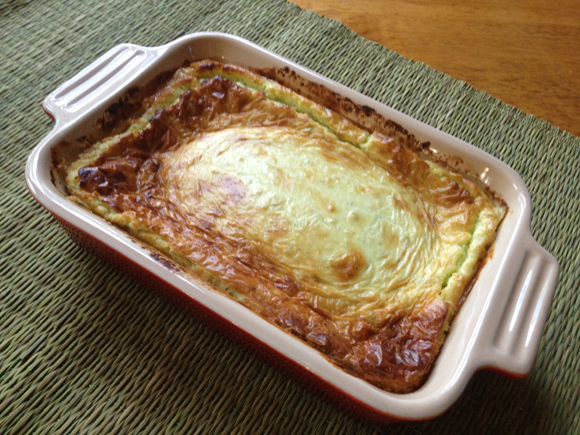 She’s been blogging since 2008, and her index of recipes is quite extensive. At first I decided to make something sweet, and almost settled on her Blackberry Oat Muffins. But then, I flirted with Carrot Cake Pancakes and with Pistachio Dark Chocolate Toffee. 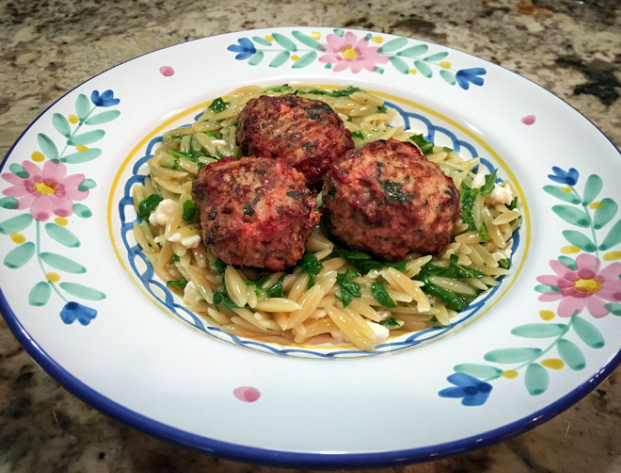 Not sure what happened to my sweet tooth, but the outcome was nevertheless perfect: a fantastic dish of juicy meatballs laying on top of toasted orzo. Life on Food means life is good! Heat the oven to 400 degrees . In a medium saucepan, heat the chicken stock over low heat; keep warm. In a small bowl, soak the bread in the milk. In a large bowl, combine the lamb and egg. Wring out any excess milk from the soaked bread and crumble the bread into the meat. Stir in 1/4 cup parsley, onion, garlic, lemon zest, oregano, 1/2 tsp salt and 1/4 tsp pepper. Drizzle with olive oil; mix. Roll the mixture into 20 meatballs and arrange on a nonstick or parchment-lined baking sheet. Bake until browned, 15 to 18 minutes. Meanwhile, in a medium saucepan, melt the butter over medium heat. Add the orzo and cook until golden, about 5 minutes. Stir in a few ladles of the warm stock and allow it to absorb before adding more. Keep adding stock a little at a time and cook until the orzo is al dente. 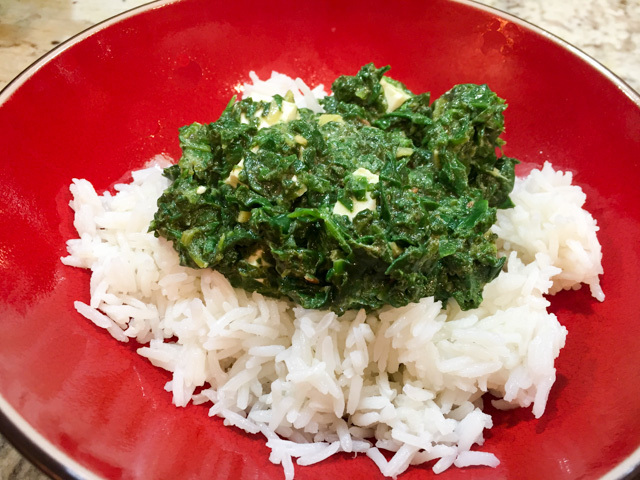 Stir in the spinach to heat through in the last-minute of cooking. Remove from the heat. Stir in the lemon juice and feta. Serve the orzo in shallow bowls. Top with the meatballs and remaining 1/4 cup parsley. Comments: In the opening paragraph of her post on this recipe, Emily says… I plan my meals, snacks, grocery lists days in advance. I don’t want to be unprepared. Currently I have only about 2 cups worth of flour. I want to make muffins that require 3 cups. I am stressed. That gave me such a big smile, because I am exactly the same way. With the added quirk of often forgetting what I have hidden deep inside in the pantry, so I “think” I have only a cup of flour, but two unopened bags will be found when I bring yet another from the store. I never fail to amaze myself. 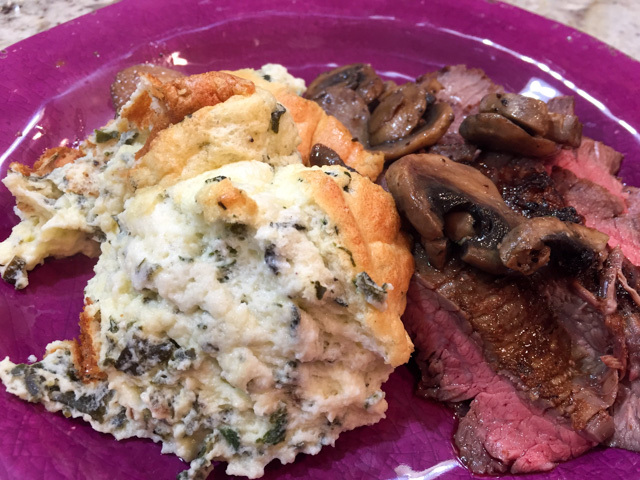 This was a great meal, my main change was to use a gluten-free bread which I had in the freezer begging to be used up. The bread was made with almond flour and some ground nuts, I thought it would go nicely with the lamb meatballs, and indeed it worked well. The toasted orzo was super creamy, more like a risotto with all the starch of the pasta as part of the sauce. It did not take that long to cook, we like our orzo very al dente. Set a rack in the center of the oven and heat the oven to 450°F. Heat 2 Tbs. of the oil in a heavy, ovenproof 12-inch skillet over medium-high heat until shimmering hot. Add the mushrooms, sprinkle with 1/2 tsp. each of salt and pepper, and cook, stirring, until browned and tender, about 3 minutes. 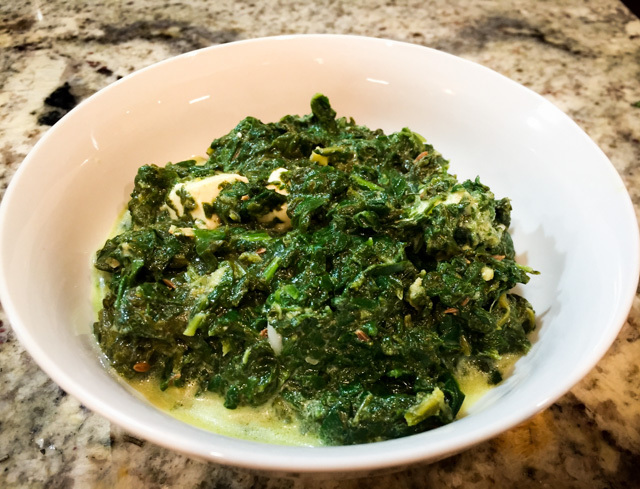 Stir in the spinach and sun-dried tomatoes, sprinkle with salt, and cook, tossing well with tongs, until the spinach is wilted, about 2 minutes. Transfer the mixture to a colander and set the skillet aside. Butterfly the tenderloin by making a horizontal slice lengthwise through the meat almost all the way to the other side. Open the meat flat, like a book. Cover with plastic wrap, and using a meat mallet, a small, heavy skillet, or the heel of your hand, lightly pound the pork so that it’s 1/4 inch thick. Rub the pork all over with 1 Tbs. of the oil, the lemon juice, and sprinkle all over the zest of the lemon and about 1/2 tsp. each of salt and pepper. 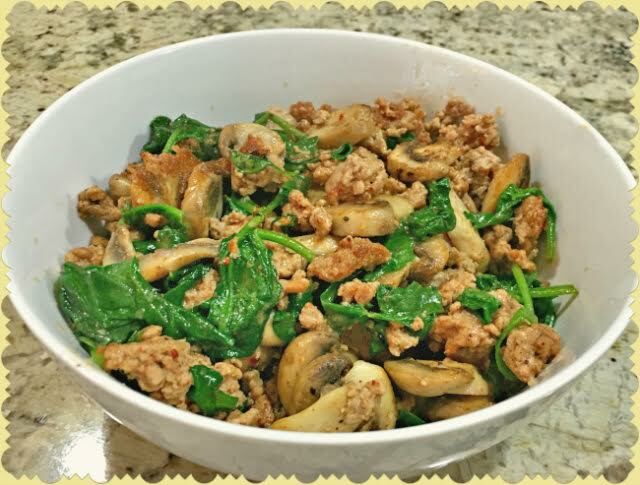 Squeeze any excess liquid from the spinach and mushrooms. Spread over the pork, leaving bare a 2-inch border along one long edge. 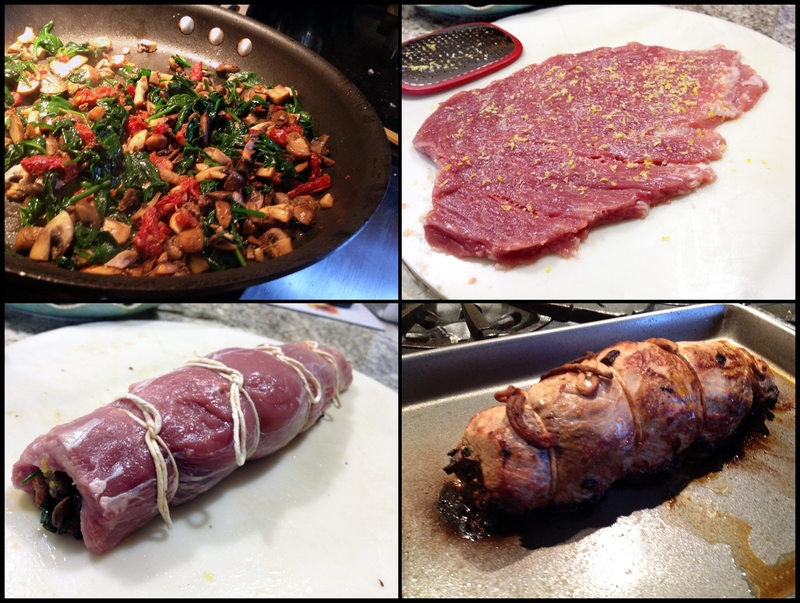 Starting with the long side that’s covered with filling, roll the stuffed tenderloin toward the bare-border side so that it forms a cylinder, and tie it with kitchen twine. Wipe the skillet clean if necessary. Heat the remaining 2 Tbs. oil in the skillet over medium-high heat until shimmering hot. Sear the pork on all three non-seam sides until well browned, about 6 minutes total. Flip onto the seam side, then transfer the skillet to the oven. Cook until an instant-read thermometer inserted into the thickest part of the roast registers 140ºF, 15 to 20 minutes. Transfer the meat to a clean cutting board, tent with aluminum foil, and let rest for 10 minutes. Meanwhile, return the skillet to the stove over medium-high heat (be careful; the skillet’s handle will be hot). Add the shallots, season with 1/4 teaspoon salt, and cook, stirring, until the shallots soften and brown, about 2 minutes. Add the chicken broth, sherry vinegar, and simmer briskly until the mixture reduces by a bit more than half, about 4 minutes. Stir in the cream and season with salt and pepper to taste. 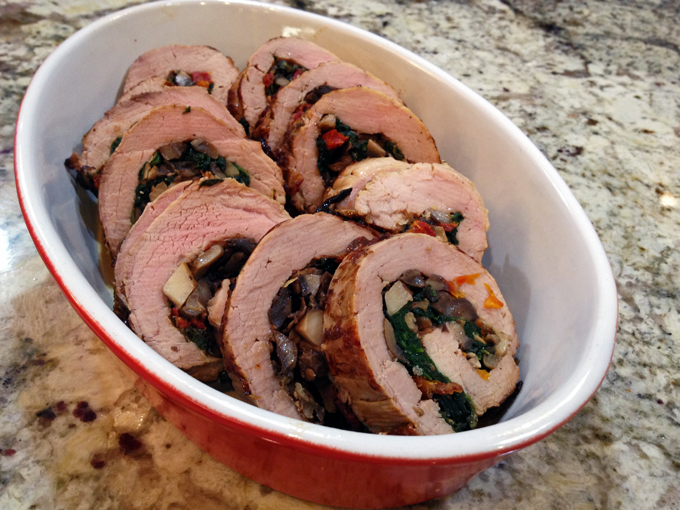 Slice the pork into 1/2-inch-thick slices and serve with the sauce. Comments: The only problem when cooking pork tenderloin is the delicate nature of this meat, and its tendency to dry during roasting because it has such low-fat content. By filling it with the sautéed mixture of veggies, you won’t run such risk. I prepared the filling, rolled the meat, wrapped it in plastic and left it in the fridge for several hours, then finished it all up for our dinner on a Saturday evening, back in January. You can serve it with any type of starchy side you’d like, pasta, rice, mashed root veggies, but in this particular dinner I went with a much lighter option, and enjoyed it with a side of grated carrots lightly seasoned with lemon juice & olive oil. I like to keep it in the fridge for an hour or so, then add salt and pepper right before serving. It is amazing what a touch of lemon juice can do to grated carrots. I first read about it on Leite’s Culinaria, after a tip from our friend Cindy. Try it sometime, nothing could be simpler, but you’ll find yourself making it again and again. TWO YEARS AGO: Spring has Sprung! These appetizers would be great for a tapas party or to share with guests before a Tex-Mex meal. They are very simple to prepare and both can be assembled in advance. Conveniently, both recipes are baked at the same temperature, 375 F. When your guests arrive, stick the dishes in the oven, and they will be done by the time everyone is settling down, getting ready to enjoy the evening. 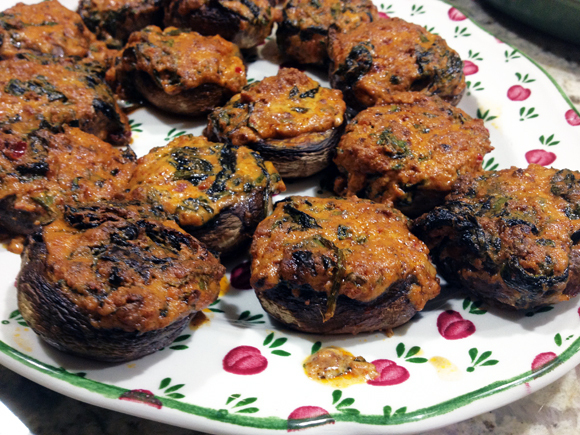 I cannot decide which one I liked more, but chorizo has been a favorite ingredient these days, so maybe I lean towards the stuffed mushrooms as the winner. 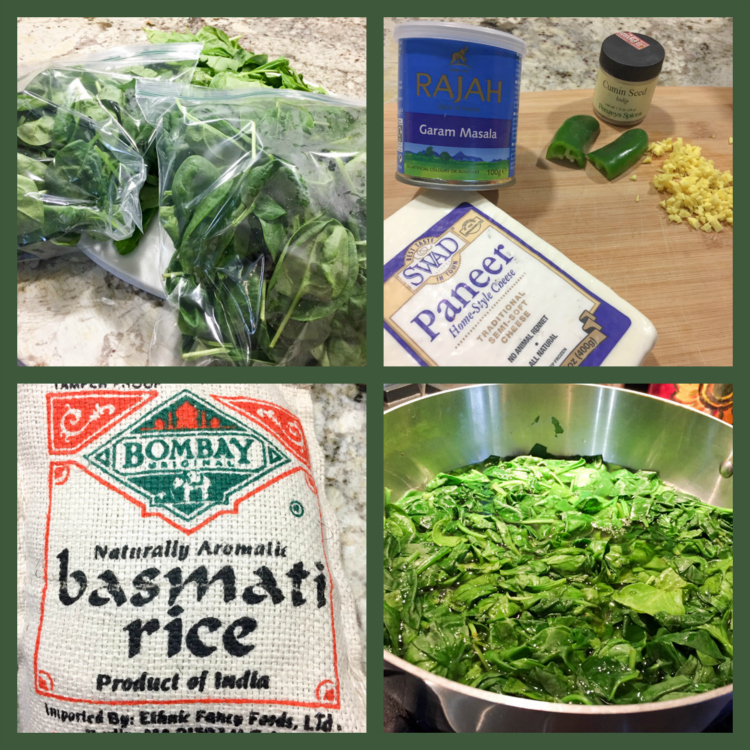 The recipe I’m sharing with you today came from Melissa’s blog, “I Breathe I am Hungry“, which is a great site for those into low-carb and gluten-free nutrition. Even though I don’t fall into any strict category, whenever I host a dinner party I like to include options that are lower in carbs, especially when it comes to appetizers because carbo-loading before a full meal seems a bit excessive. 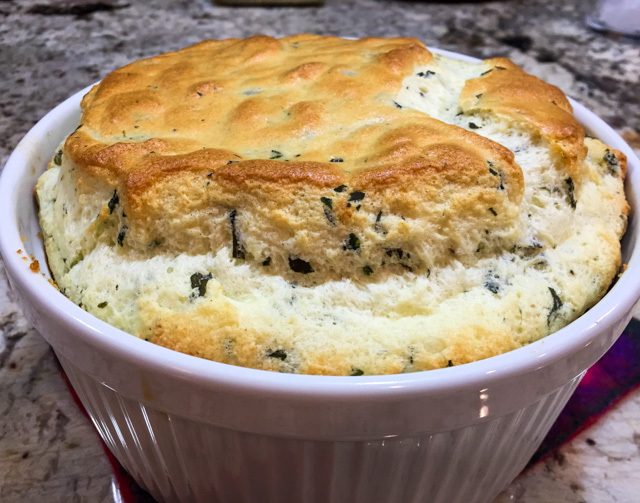 The second recipe I won’t be sharing with you, but you can get it by ordering Melissa’s e-book The Gluten-Free Low Carber, which is a fantastic source of recipes, many of them not available in her blog. Remember that even if you do not own an iPad or Kindle, e-books can be assessed from your laptop. Remove chorizo from its casing and saute in a medium frying pan for a few minutes. Add the chopped shallot and cook for about 3 minutes until translucent. Meanwhile, clean off the mushrooms and remove the stems. Place the caps on a large plate and microwave for 2 minutes to soften. Add the cream cheese, shredded cheese, and baby spinach leaves to the chorizo mixture. Stir well and cook for a minute or two until the spinach wilts. Remove from the heat. Stuff the mushrooms with about a tablespoon each of the filling. Place on a cookie sheet and bake in a 375 F oven for about 10 minutes. Longer if you like your mushrooms really soft. Remove and cool for a few minutes before eating. And now the second appetizer: a Jalapeno Popper dip, creamy, spicy, truly delicious! Of course, you could send the low-carb for a walk and dive into this dip with crackers, toasted baguette rounds, and tortilla chips. But if that’s not acceptable think about slicing jicama very thinly and using the slices as a chip. Whatever rocks your boat. 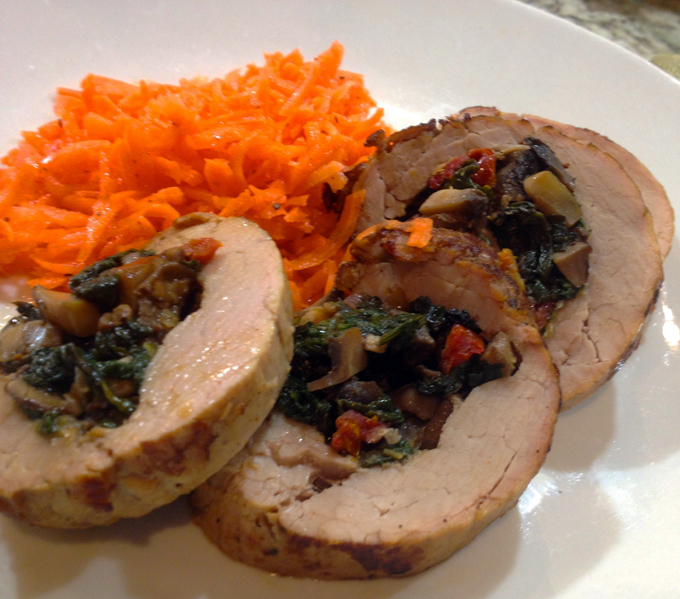 For the full recipe get Melissa’s e-book, The Gluten-Free Low Carber. I highly recommend it! Her recipes are very creative, and even if you don’t worry about carbs and gluten, you will find plenty of stuff to drool over. Some of my favorites: Spaghetti Squash Carbonara (a happy accident in her kitchen). three versions of Flax Crackers, Buffalo Balls (don’t worry, it calls for ground chicken… ), Ham and Spinach Calzones (yes, gluten-free, very interesting dough using cream cheese), Faux-lafel with Tahini Sauce (creative twist on a classic) and of course I absolutely must make her Brazilian Chicken Pies. She also offers recipes for gluten-free pie and pizza crust, as well as low-carb ketchup, barbecue sauces, and salad dressings.